It's asparagus season!! 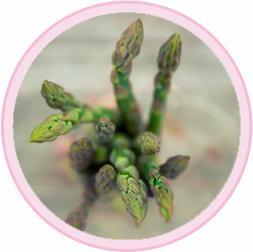 Not only is it delicious, asparagus is rich in essential vitamins, minerals and fibre while being low in carbs and calories. Asparagus and eggs are a perfect match. I love steamed asparagus drizzled with olive oil and topped with a runny poached egg. This simple asparagus frittata is also super easy to make and as you can eat it hot or cold, it's really versatile. I eat it served warm for breakfast and then I keep the rest in the fridge for a speedy lunch, served with tomato salad. This recipe is also perfect for anyone on Phase Two or Three of the Proteifine Diet. Beat the eggs and add in a pinch of salt and pepper. Heat the olive oil in a medium size ovenproof frying pan over a medium heat. Don't allow the oil to become so hot that it smokes. Break the fibrous ends off the asparagus, add to the pan and cook for 5 minutes. Add in the eggs and cook for 3 minutes. Transfer to the oven and bake for 15 to 20 minutes, or until golden and cooked through. Cut into quarters and serve hot or cold. It works well with fresh tomatoes or a home made tomato and basil sauce.